February, 1958; October, 1969; and August 1971. During the 20th century, Middleborough had a number of diners including most notably Sisson’s Diner in South Middleborough and the “Wind Tunnel” on Wareham Street. 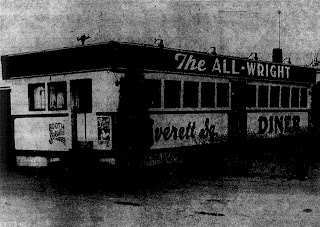 Perhaps less well remembered was the All Wright Diner which was located on Station Street at Everett Square. 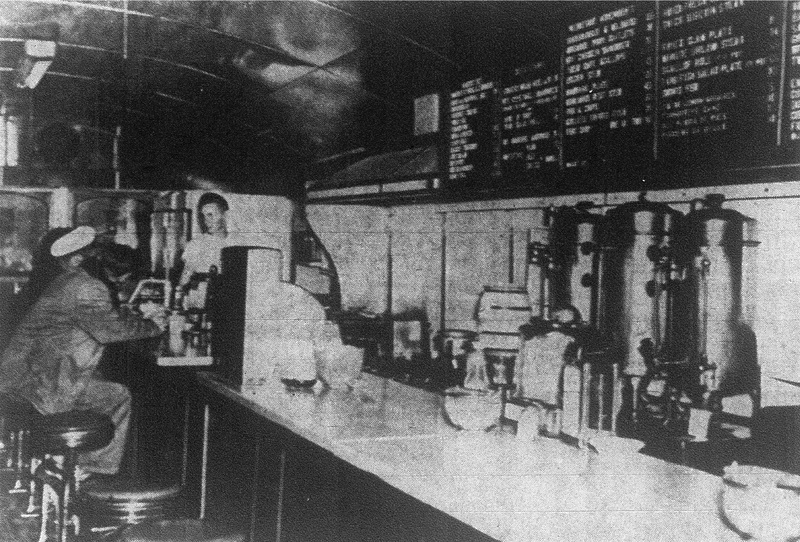 Established in 1952 by Charles B. Goodwin, the Everett Square Diner was known as Charlie’s Diner and was operated by Goodwin for three years until February 1955 when he sold it to enter the sign business. The purchasers were Helene E. (1910-2011) and N(athan) Ernest Wright (1903-1959). Mrs. Wright had come to America in 1926 and was employed for 26 years by the George E. Keith Shoe Company before entering the restaurant business. 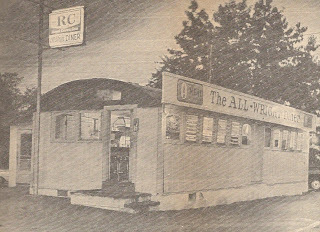 The diner they acquired was a narrow wood-frame structure with a barrel vaulted roof. A service counter behind which was located the preparation area ran the length of the rear side of the diner while the Station Street side was occupied by a range of booths with glass jalousie windows overlooking the street. 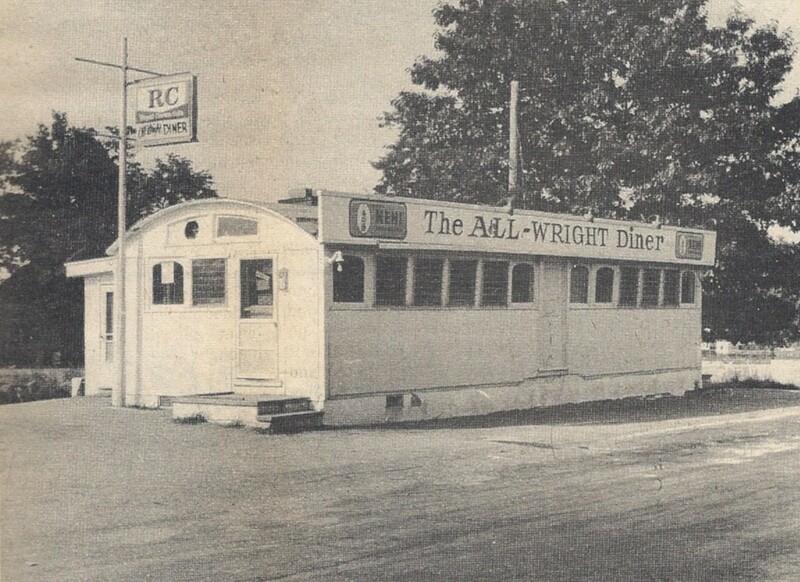 The shape of the roof on the exterior was disguised by signs with the "All Wright" name, while the base of the diner remained painted with the alternative "Everett Square Diner" for a period in the 1950s. Later, now nostalgic advertising signs for NEHI would be added. 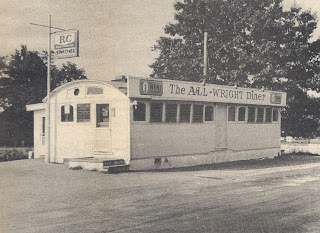 Entrance to the diner was through doorways at the center of the diner on Station Street as well as the northeast end closest to Everett Square. In time, this latter entrance would become the principal one. 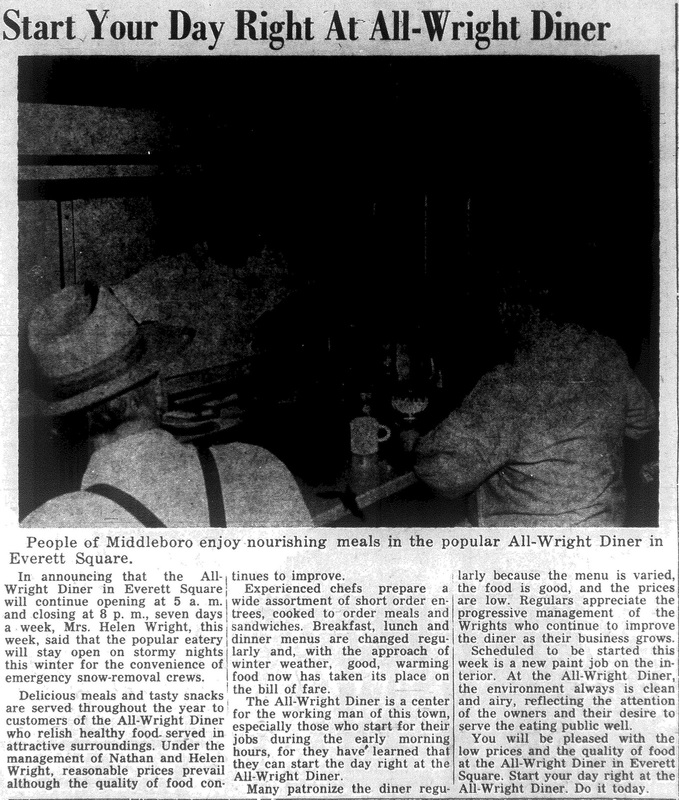 In 1972, Mrs. Wright retired and the diner was closed. Middleborough, MA, photographic halftone, January, 1956. 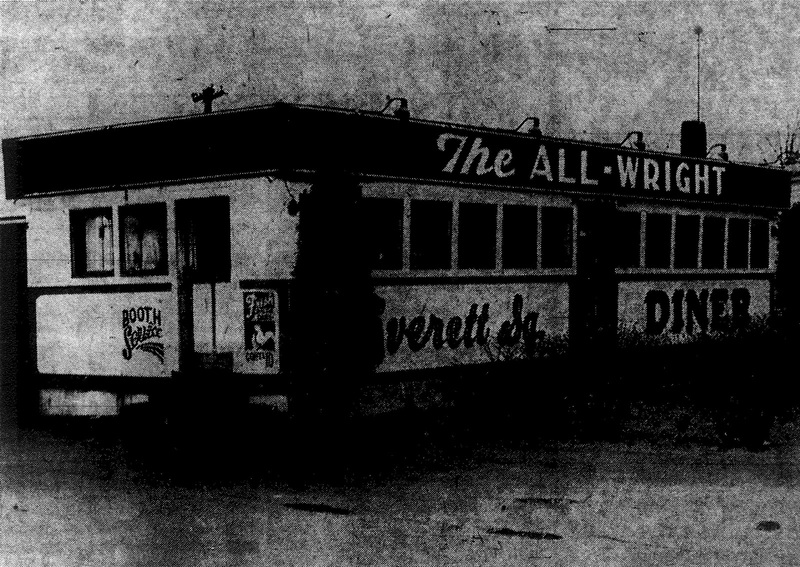 This was my great aunts diner and I remember as a child going in and helping her..It was so much fun it didn't feel like work. I was so happy to see these pics of the place. Miss you auntie Helene..